I'm basically in love with my cast iron skillet. It works better than most of my traditional pots and pans, and actually comes with some health benefits. Tonight I decided to bust out my iron to make an easy appetizer: brie fondue! Brie has a mellow and somewhat nutty flavor, which is best accented by serving with sweet ingredients. In the past, I've served my brie with dates and stuffed in mushrooms. And paired with crispy sweet asparagus and sharp salami. 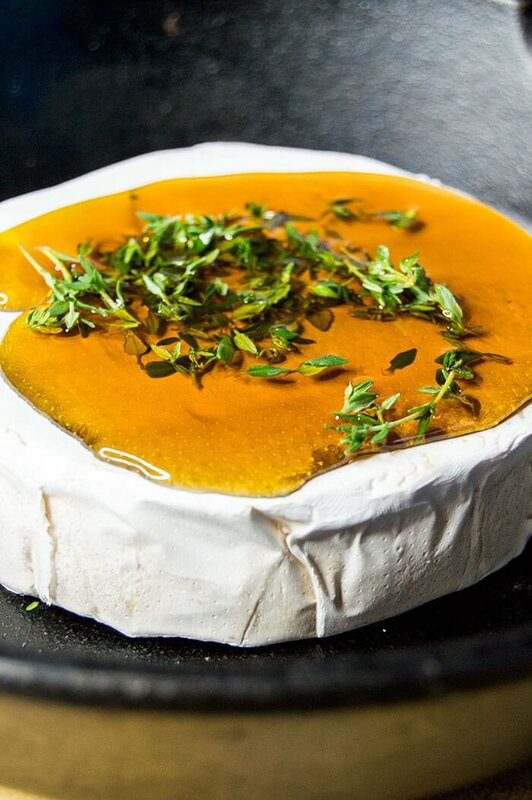 But tonight I paired my brie with some maple syrup and fresh thyme, to really enhance its flavor. 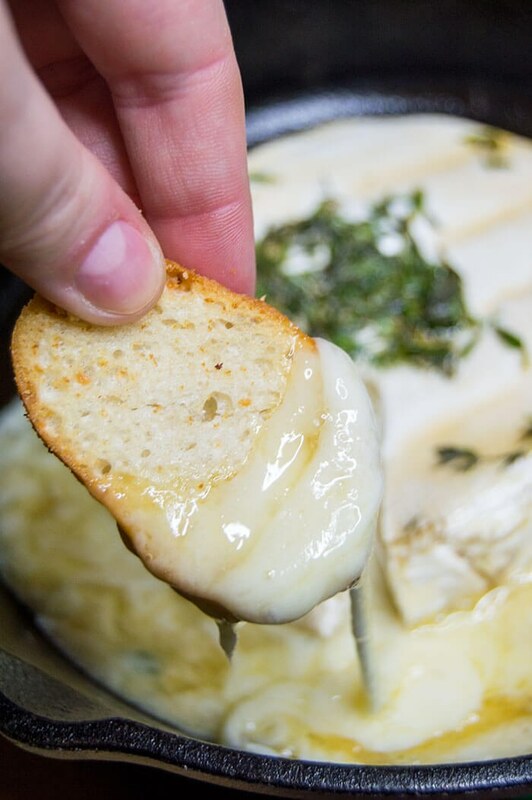 Probably the best thing about brie fondue, aside from its deliciousness, is that aside from pouring the maple syrup and sprinkling the thyme on top, all you need to "do" is put it in the oven. Then just let it go until it reaches the perfect fondue consistency. I baked mine for about twenty minutes at 400 F, until the brie was ever so slightly puffed up in the center and wobbled slightly when shifted - that's how you'll know it's nice and melted on the inside. To serve, you can either use a large spatula (one large enough to hold the entire brie wheel) and transfer it carefully to a serving platter - or you can serve it like I did: with a warning that the cast iron was "HOT HOT HOT!" Just cut a little slit from the center to the edge with a sharp knife to unleash the molten brie held within. We ate ours with some croustini and fresh vegetables - and devoured the whole thing instead of eating dinner! 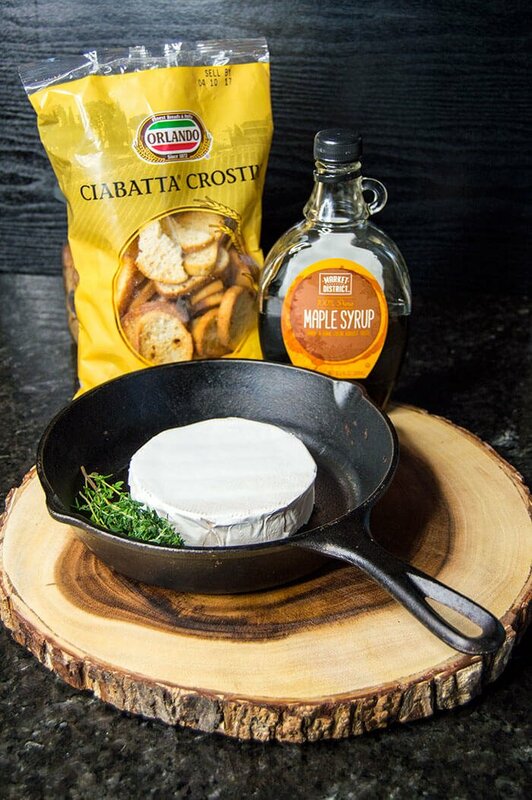 Preheat the oven to 400 F. Place the brie cheese into the center of the cast iron skillet. Pour on the maple syrup until it reaches the edges - try not to overflow the top of the brie or else the maple syrup will start to burn if too much is in the skillet too early. Sprinkle on the thyme. 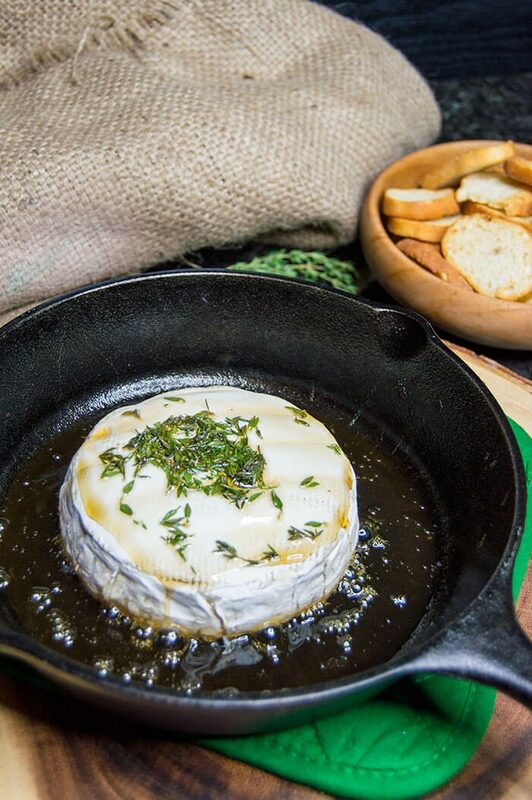 Bake for fifteen to twenty minutes, or until the center of the brie is wobbly and just slightly puffed. Remove from the oven and cut a slit from the center through to the edge. Serve with croustinis and fresh fruit and vegetables. Enjoy!